It occurred to me to that someone might ask why I chose the Andromeda Galaxy as the setting for my series. The answer is simple, I like that galaxy. I love the pictures that I’ve seen that allow my imagination to explode with possibilities. Because the galaxy is so far away from us, very little is known about it. I figured that I’d give you a bit of info on this famous Galaxy. The Andromeda Galaxy, also known as the Great Andromeda Nebula, Messier 31 or M31, is the closest galaxy to our Milky Way Galaxy at just over 2.5 million light years away. If we wanted to travel there today, it would take about 15 billion years utilizing the SaturnV rocket, which happens to be the fastest rocket to date. So, every time we look into a telescope to see this beautiful galaxy, we are looking 2.5 million years into the past, as that’s how long it takes the light traveling from those stars to reach us. I think it’s safe to say, that if there are any beings living there, they are probably quite a bit more advanced than us. The galaxy, was created about 5 to 9 billion years ago when two smaller galaxies collided. By the way, Andromeda and our Milky Way galaxy are headed for a collision. Just so you know, we only have about 4 billion years before this happens. And when it does, it’ll take a few million years for them to completely combine. Depending on where the earth is in its current rotation within our galaxy, will decide the outcome. It’ll either be tossed out into space, or destroyed when too many stars come near our solar system. I’m thinking that being on earth at that time might not be all that fun. 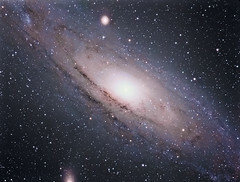 Andromeda is a spiral galaxy with about 1 trillion stars, or suns. Even though it has more stars than our galaxy, we have more mass because of Dark Matter. The stars in Andromeda range from new to geriatric and ready to go nova. 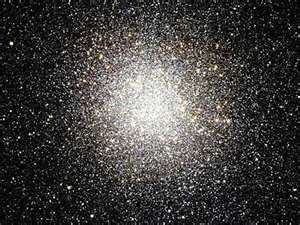 There are several Globular Star Clusters, about 460 or so. Even though these stars are very close in range to each other, it is believed that planets wouldn’t survive. Needless to say, that my stories don’t take place in these clusters. So far, scientists have only been able to find one potential planet in M31. It’s said to be about 6 or 7 times the mass of Jupiter. Can you say MASSIVE?! And they actually only found it by accident. They thought it was two suns orbiting each other, but through a process called Microlensing, they figured out that it was a planet. Microlensing is based on the gravitational lens effect. A massive object (the lens) will bend the light of a bright background object (the source). This can generate multiple distorted, magnified, and brightened images of the background source¹. My fictionalized depiction of this galaxy will give you a glimpse of only a small section. Each star system is named for the main species which started there. However, each system is currently occupied by several aliens. I have created species that resemble lizards, plants, and combinations of other things. This creation process has been challenging and fun and I can’t wait to share some of it with you. Over the next few months, I’ll be sharing some of the planets. species and characters. Ok, enough science for now. I’ve included a little gallery of pictures of the Andromeda Galaxy. Enjoy!